43 races. That is four and a half years of Key West Race Week packed into five days of sailing and as fate would have it, it came down to the last run of the last race. Going into the double points race we had a slim lead over Gitana and ETNZ. With one-minute to go before the start we made an aggressive call to start on port and go for the port tack cross of the fleet. It did not work but a crisp tack underneath Gitana kept Artemis with her nose poked and still in the hunt. ETNZ benefited from a slight right shift as the fleet extended left and would quickly extend out to a commanding lead. 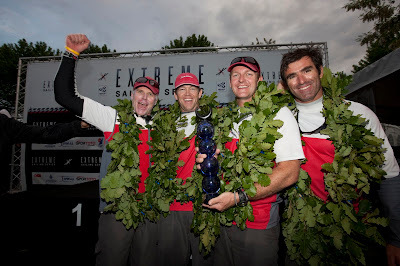 We rounded the weather mark 4th comfortably ahead of Alinghi who copped a penalty for hitting the weather mark. At this moment the points were in favor of ETNZ. We needed a "break"! As fate would have it, our break came with Pindar sailing the wrong course as we rounded the last top mark for the run to the finish. Did we get a break from somebody else's mental mistake? Yep. Were we lucky? Probably, but I can also look at about 50 other opportunities that we were equally unlucky so in the world of swings and roundabouts I would say we were fairly even. Either way we kept ourselves in the hunt the entire regatta, no quitting, just determination from a great group. My hat's off to Julien, Rodney, Morgan, Dog, Nick and Brad for the great effort in getting Artemis Racing around the race course. It was a great "team" win. I also extend my congratulations to ETNZ and Gitana great competitors as always in an unbelievable competition. Off for a quiet celebration and then bed.